There are weeks I love complex meals. I will spend hours in the kitchen making the perfect recipe. Then there are days like today where I want simple comfort food. Hence why I currently have pinto beans in the crock pot and I will be making cornbread later in the afternoon. There is something about the beginning of summer that makes me want to have something warm and comforting one more time before the weather and humidity make me want nothing more than cold iced tea and lemonade. To me pinto beans are not only part of what I love about West Virginia, but they make me remember what I love about food and cooking, sometimes the simplest of dishes are the best. One simple dish that I love in the warm summer months is salad. Cold side salads are such a great option, they are cool and refreshing. Last week I tried a new recipe for Grilled Chicken Thighs with Cucumber Mint Salad from the June 2013 issue of Eating Well magazine. This recipe has 10 ingredients. It takes 35 minutes of total time, all of which is active and makes 4 servings. I did make changes to the original recipe. First since I have three males to feed I doubled the recipe. One chicken thigh for each person just wouldn't have cut it. I think I may be the only food blogger that does not have a mortar and pestle, so for the garlic paste I used the side of a knife. I use this method frequently and it is a perfect substitute. My outside grill is still out of commission so to cook the chicken thighs I used my indoor electric grill. It would also work well under the broiler. To me the star of this dish was the cucumber salad. It was light and the perfect palate cleanser for the chicken thighs. The flavor of the rub on the chicken was great and would work well with other cuts of chicken (such as breasts) or even fish. At under 2 dollars a serving this is an inexpensive meal option for summer. 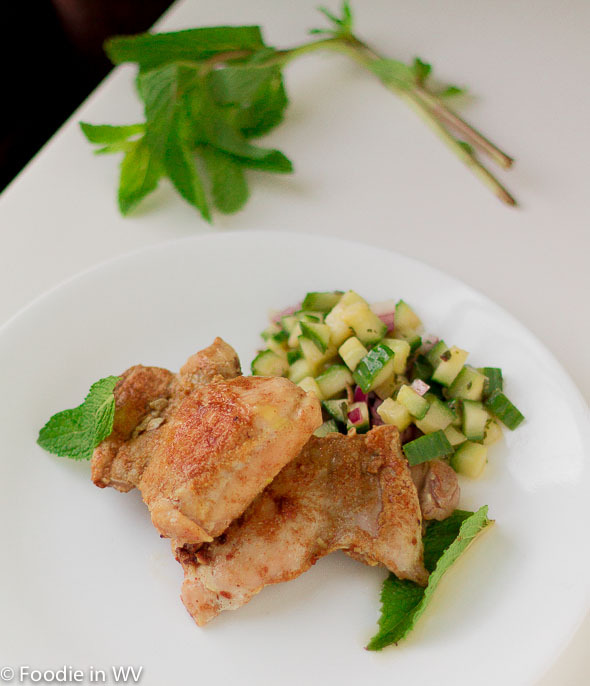 For the recipe go to Grilled Chicken Thighs with Cucumber Mint Salad. My mother was from West Va. To this day, I can remember endless pots of beans simmering on the stove and this was in a place that was summer all year round ( Miami). There are days that I want simple, and days that I am willing to go al out for a dish. In the end, I think I prefer simple. Beans are definitely a West Virginia staple :) I prefer simple in the end too. Good food is great no matter how simple the recipe. Plus it is much easier to make! I am not a huge cucumber fan but the pic makes it look quite inviting! I'll be trying it out. My husband eats 6-8 chicken thighs in one sitting so I totally get what you are saying about 1 thigh each not being enough. LOL. Heading over to bloglovin to follow you! I can go either way with cucumbers, but I love pickles :) With three men in my house there is no way that 4 thighs would be enough, they eat at least 3 a piece. I normally eat at least too myself. Going over to check out your site now! We always have to make extra in our house too, I find it frustrating sometimes when I try to make food look pretty but I've had to pile it all in a heap on the plate! This looks delicious and refreshing. The boys in your house are so lucky having such lovely meals every night! I said I would try to cook something new once a week and never end up doing it, your blog makes me want to get cooking! I understand completely, the males in my house never appreciate presentation either :) Some weeks I cook more than others, I normally have a few standbys that I make frequently like pinto beans and roast chicken. They are easy to make for the nights that I just don't have the energy! This looks so good. My hubby probably won't like the mint/cucumber, but then again -he could cook his own dinner, right? Sounds yummy as always! Its summer, time to grill :) I am not really a fan of cucumber.. but this dish could change my attitude towards it.. Thanks for the recipe. I like cucumbers in some things and not in others. It really depends on the recipe. Summer and salads do seem to go hand in hand! Very nice healthy and lite summer meal! Big cucumber fan! It is healthy and the cucumber salad is delicious! This looks delish! I'm definitely going to have to make this! Loving your blog! Thanks for stopping by mine! I am following and looking forward to more delicious recipes! Cucumber mint salad? OMYGOSH! Sounds yummy. Im gonna have try this during the summer!!! The salad was definitely the highlight of the recipe! This looks amazing and I'm going to try it tomorrow night. Thanks for visiting my blog asI wouldn't have found yours if you hadn't. I absolutely love it! Amazing recipes. Thanks for the sweet comments :) When you try the recipe tell me how it turns out, I love hearing good or bad how things work for other people!